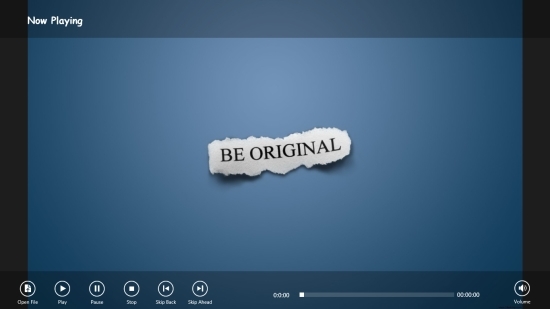 Media Player is a free Windows 8 Media Player that lets you play audio and video files on your system. Using this simple Media Player, you can browse audio/ video files on your system and play them on a clean, clutter-free interface. This Media Player supports common audio and video file formats such as mp3, mp4, and wmv. You can watch videos in full screen mode and enjoy a rich and enhanced experience. This lightweight Media Player is available under Music & Video category of Windows Store. It is a basic Media Player having all the necessary functional options. So, if you are looking for a simple media player to play audio/ video files on your system, you can get this one by clicking on the link given below at the end. To use this Free Windows 8 Media Player to play your favourite songs and videos, you will first need to install and launch it on your Windows 8 PC. The main screen of the app is simple with just a caption displayed and no advanced graphics. As you right click on the screen, the app’s bar will display various functional options that includes Open File, Play, Pause, Stop, Skip back, Skip ahead, and Volume. Just like various other media players, this one also has a slider that displays progression of a media file in terms of time. Click on Open File to browse and select an audio/ video file that you wish to play. The Media Player will start playing the media file in full screen mode. With a right click on the screen, the app’s bar will re-appear displaying various functional options. A top flyout will also appear that will display the name of the media file. Also check V2PLAY, PL@Y, and Dual Player. Media Player is a simple Media Player capable of playing audio and video files in common formats. If you want to have a simple media player to listen to your songs and watch videos, then you can try this one. Try it out and share your feedback via comments.